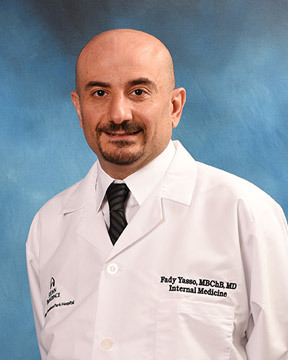 Dr. Fady Yasso is a board certified Internal Medicine physician. Dr. Yasso has passion for Internal Medicine as he enjoys the continuity of care as a primary care physician as well as taking care of patients when they are admitted to the hospital. Internal medicine has allowed him the opportunity to ... Read More take care of a wide spectrum of medical cases. From his interests is obesity and dealing with its complications such as sleep apnea and non-alcoholic fatty liver disease. He has had success working with patients on weight loss through a supervised program before seeking surgery. Dr. Yasso graduated in 2006 and completed his Internal Medicine residency at the Detroit Medical Center/Wayne State University College of Medicine; he received multiple awards in regards to patient care and academic achievements. He is a member of the American College of Physicians & the Christian Medical and Dental Association. He remains current on the latest issues in healthcare by reading publications, attending national and international medical conferences, teaching students and residents and exploring newly published medical articles. Dr. Yasso's goal is to provide information to patients in a simple manner and make sure they understand the plan of care before leaving the offices, when needed he uses illustrations to explain to the patient. Dr. Yasso says "As a physician, I learned that I must always focus on making a diagnosis, there are no two cases that looks alike, every plan of care is to be tailored to that person in different way than others, I care about the small details as much as the big details, all the small complaints that are frequently ignored can be a major clue to the main diagnosis. I try to re connect all these together to make sure we don't miss anything."